Dr. Donna always knew she wanted to be a veterinarian. 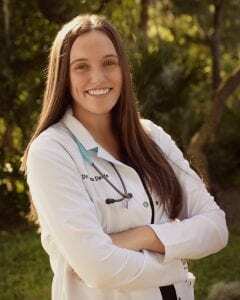 As a high school student, she volunteered at several vet hospitals, and now offers that same courtesy to interested local students from Veterinary Science Academies at Lakeland and George Jenkins Senior High School and McKeel Academies in Lakeland, Florida. Dr. Donna did her undergraduate studies at Virginia Tech, where she became fascinated with both human and animal behavior. She completed a Bachelor’s Degree in Psychology in 1993, and then went on to receive a Master’s Degree in Psychology in 1995, focusing on Neurological Research, before pursuing her childhood dream of becoming a veterinarian. After graduating with her DVM in 2002 from Virginia Tech, Dr. Donna married her best friend, Kevin. 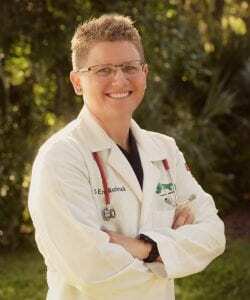 A year later they relocated to Florida, where she joined a four-doctor, AAHA-certified companion animal practice in Tarpon Springs, where she practiced until 2007. In May of 2007, Dr. Donna, her husband Kevin, and their 4-legged children moved to Lakeland to purchase My Pet’s Animal Hospital. In 2009, Dr. Donna purchased Sarasota Animal Hospital, a 2-doctor AAHA-certified practice, with her colleague, Dr. Mark Downing, who serves as the Medical Director. Since moving to Lakeland, Dr. Donna has become involved in various community groups and activities such as the Chamber of Commerce, NAWBO, ABWA, BNI, Emerge, Leadership Lakeland (Class XXVII), Leadership Polk (Class VII), The Lakeland Rotary Club, Lakeland Business Leaders, and the Lakeland Runners Club. Donna & Kevin welcomed their daughter, Shae, into the world in June of 2009. Prior to the birth of their daughter, she was also a member of the Lakeland Landsharks (triathlon club), and hopes to pursue this interest again in the future. For now, she stays fit with HakaFitness and running. 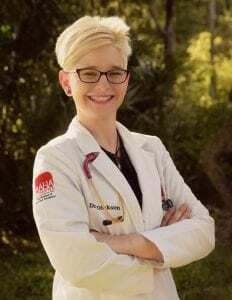 Dr. Donna is currently serving as the President of the Ridge Veterinary Medical Association, is a member of the American Veterinary Medical Association, the Florida Veterinary Medical Association, and the American Animal Hospital Association. She is certified in Canine Rehabilitation (physical therapy for dogs) and in Veterinary Acupuncture. She practices Integrative Veterinary Medicine, which combines Traditional Chinese Veterinary Medicine, or TCVM, Acupuncture, Physical Rehab, Medical Massage, Herbal Therapy, Food Therapy, with traditional (Western) Veterinary Medicine. She is also a specialist in Behavioral Training which helps pets eliminate issues like separation anxiety & obsessive behavior.